Welcome to the first in a series of posts for my very first CAL! I’m nervous about putting this design out into the world in CAL form since it’s something I’ve never done before. There’s a certain kind of vulnerability around sharing work with the world in this way. But I know that the upside is that we will get to create some pretty amazing community around a craft we all love. And that makes it all worth it! ETA: The CAL is now live! Jump to the post you need below. I’ll update this with links to the different posts as they’re published. In this post, I’ll talk about the yarn I used to design Marguerite, guidelines to keep in mind for selecting your own yarn, and what to do to prepare for the start of the CAL. There’s a little bonus feature midway through the post, so be sure to read all the way through! The planned pattern release date will be Friday, January 25, 2019, and the CAL will officially begin on Friday, February 8, 2019! I am anticipating the CAL to run for 8-10 weeks. Because you will have access to the entire pattern ahead of time, the CAL blog posts will focus on each of the steps of the pattern (e.g., making full motifs, half motifs, joining, etc.). But you can of course work at your own pace. You might consider joining my closed Facebook, MobiusGirl Crochet Nation, in order to best follow along with CAL updates, and to enjoy each others’ progress photos! If you’re not already on my mailing list, you can sign up below to receive blog updates by email. You can also join the Ravelry CAL hosted by Julie Yeager. I designed my Marguerite Blanket using mostly Madelinetosh DK Twist. The version I made is meant to be an heirloom piece, with premium yarn to match. What I especially like about the Madelinetosh line are the beautiful effects created by hand-dyed yarns. I only use a handful of colors in the design, but the speckles and variations on each shade add texture and depth to the overall piece. Since I was using stash yarn, some of the colorways I used now appear to be discontinued. I’ve chosen some substitutes for the list below that are close approximations. For the full motifs, I used Antler, Glazed Pecan, Foundry, Calligraphy, Star Scatter, Leopard, Rose, Doe Eyes, Horn, Toner Cartridge, Eleven Lite, & Weathered Frame, 1 skein each. For the triangles, I used Poe & Patched Indigo, 1 skein each. I also used 2 balls of Cascade 220 Superwash in Charcoal (#900) for the border, along with the remainder of two of the skeins from the motifs. Madelinetosh DK Twist is a 100% Merino wool yarn. Although classified as DK, I find it to be a little heavier than other brands’ DK yarns. I used a 5.5 mm hook, which is on the upper side of the range of suggested hooks. Because the design relies on tapestry crochet, it can help to use a larger hook to accommodate the extra thickness from working over the unused yarn color. If you don’t want to use wool, other fibers are of course fine. Cotton blends, such as Scheepjes Stonewashed XL, would work well. I especially like its textured nature. Acrylic yarns would be fine also. KnitPicks Brava is one of my favorite all-purpose acrylic yarns. It’s a worsted weight yarn, but would work well for this pattern. Although I love working with 100% cotton yarn, I might avoid it for this project, unless it’s a lighter weight. Tapestry crochet creates a thicker fabric, which creates an overall heftier blanket. The density of an Aran-weight cotton might make the blanket too heavy. I used approximately 3500 meters of yarn for the entire blanket. Keep in mind that the amount of yarn you use will depend on your gauge. Choosing the same dye lot for multiple balls of the same color of yarn isn’t really an issue for this project. Now let’s talk a little bit about how to choose colors. It’s often one of the most difficult, and also most important steps in planning a blanket. To me, the defining features of the colorway I chose include: (1) using multiple shades of the same color; (2) choosing mostly muted colors (gray, cream, tan) with some brighter pops of color (pink, gold), and (3) using hand-painted yarns that add visual interest and texture. Let’s break that down a little further. About 2/3 of my blanket is crocheted in solid neutral colors, or have a neutral base. The remaining 1/3 of the blanket is made up of brighter shades that are analogous to each other. This means that they are close to each other on the color wheel. I tend to shy away from starker contrasts, including complementary colors (opposite to each other on the color wheel). But that doesn’t mean that you can’t create a stunning blanket using lots of contrast! What if you don’t want to use speckled yarns? There are other ways of creating texture and variation, including using colors that fall on a gradient. Using more than 1-2 shades of the same color will create subtle hue shifts. Combining them with multiple shades of contrasting colors will provide a palette that pops! Do you like using ombré cakes of yarn? 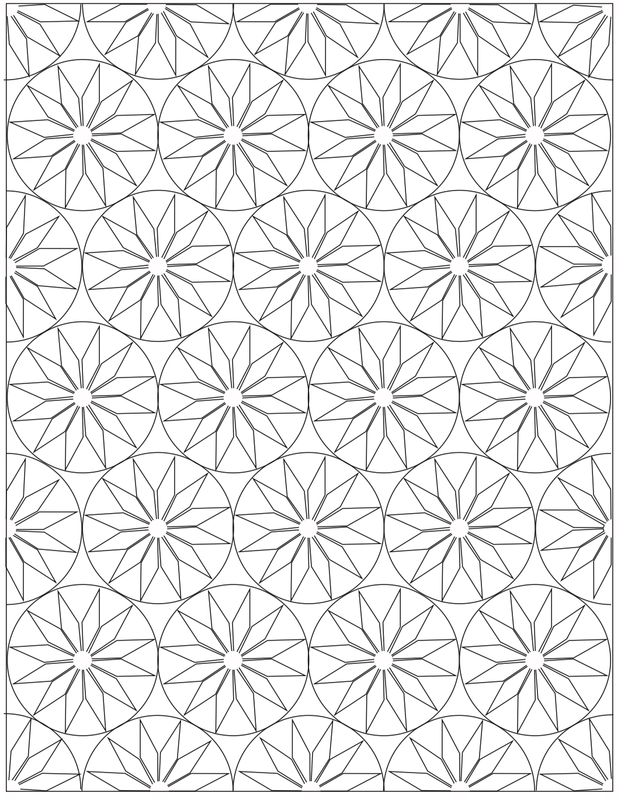 Consider using one for the petals on each motif, and keeping a consistent background for the rest of the circles. So, what if you’ve decided upon yarn, picked out a gorgeous palette, and stocked up already? If you’re eager to start stitching your Marguerite Blanket, and can’t wait for the full pattern to be released, here’s what I would recommend for getting started. You can find the pattern for the full motif here. The blanket pattern calls for making 18 full motifs. Because they will be joined as you go, be sure not to sew in the ends on the final round because you will need to unravel a little bit to join them. Making the full motifs will take up the first few weeks of the CAL, so you’ll be ahead of the game if you decide to get started now! Please share your progress on social media with the tag #margueritemotif so we can all enjoy each others’ work! Disclaimer: The ads in this post include affiliate links. If you purchase products from these ads, I will earn a small commission at no extra cost to you. Thanks for your support! The direct product links are not affiliate links. Do you think you could say how much yardage you used per color per motif. That would be super helpful! I’ll have to work up another sample – I wasn’t thinking ahead when I designed the pattern. You’re right though, that this would be helpful. I should have some time to do so later this week. Hello, I’m very excited to participate in your first CAL, and i have two questions. For those of us who prefer not to be on Facebook, will your blog posts suffice as adequate instruction and encouragement? The second question has to do with Star Sctter, one of your recommended colors; Madeline Tosh has two versions of the same yarn, a solid and a speckled one. Which are you using? Thanks for your interest! The FB group is mostly for people who want to connect with each other throughout the process. All of the important info will be available on the blog. I missed that there is a solid Star Scatter color. I’m using the speckled. Can’t wait to start on it. One question, for those who want to use the yarn colorway in the pattern, will you provide guidance on which colors to use in each motif? I am not very confident in my color choices and would like to make the throw using your suggested colors. Hi Martha, I’m sorry, I missed replying to your comment. Unfortunately, as some of the colorways I used to design the blanket have been discontinued, I haven’t included directions for which colors to use on which motif. If you check out the CAL groups on Facebook or Ravelry, you can find lots of beautiful color suggestions! Please Please Please Pretty Please will you do a forum on Ravelry? I’d be happy to run it for you!@!!!!!! Any chance a kit will become available? Your colors are perfect. Sorry, no kits for this one at this time. Thank you for your kind words! wow, in one post you educated me a lot about yard and color combinations. I think a right color combo takes your project from a regular project to an elite one. Thanks for sharing the downloadable link. You’re welcome! Color planning is can definitely be difficult, but can also totally make or break a design! Could you give an estimate on how long to leave tails for joining at later date? What I would do is to work one motif in its entirety and then frog back to the joining part and measure yardage. It depends on where the motif will go, so I can’t really give a generic answer. Hi…very excited to start this. Your design and choice of colours are stunning. Is there a charge for the pattern or joining along? Hi Ursula, thanks for your interest! The pattern is discounted through tomorrow (2/8) on Etsy and Ravelry. Hello! I love this and I want to make a rectangle – will the half motifs be included in this CAL? Thanks! Thanks for your interest! The full pattern, including the half and quarter motifs, and filler triangles, is available on Ravelry and Etsy. where can i download the full pattern for the marquerite blanket pattern please..
Hi Ansi, the full pattern for the Marguerite Blanket is available for sale in my Ravelry, Etsy, and Love Crochet shops. When will you post part 4 and the link on the introduction page be activated?